Adobe is kind of just always there; always creating a new line of products that improve our already-established workflow. But now, things are about to change. They have taken out all their controversy cards and are playing them all at once. That’s because Adobe is now preparing to drop its physical boxed software and move to a cloud-based subscription service called the Creative Cloud. And right now there’s a petition signed by over 36,000 angry web users asking the company to stop this new software distribution model. If this move was a font style, it would be “ExtraBold”. Adobe is dropping all support for the old versions of their software, Adobe Creative Suite (CS) and later. They will support Creative Suite 6 (CS6) for now. 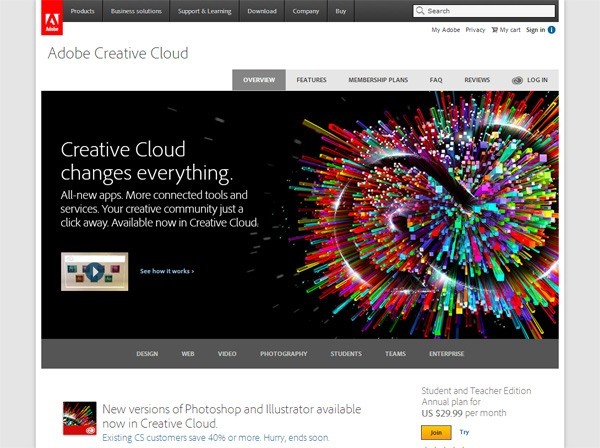 Although CS6 is still available, the new Adobe Creative Cloud (CC) will be the future. You’ll be able to just buy one program out of the Creative Cloud suite for around $19.99/month if you want. Creative Cloud software won’t be web apps that run in your web browser (one of the popular misnomers about Creative Cloud). You will still need to download and install software onto your hard drive like before, just with the benefits of cloud-based software (such as your files and data being in sync on multiple computers and devices). You’ll need to be online once a month to confirm your subscription to Creative Cloud. You can export Creative Cloud files to CS6 files. Most of the CC apps are 64-bit. They still offer discounts for schools, college students, non-profits, etc. Well, in my opinion, they are doing this in the hopes of winning on three major fronts. They win by not having to physically manufacture and distribute boxed software to stores. This may turn into cost savings associated with the manufacturing and distribution of material goods. This could (potentially) destroy or weaken Adobe’s foe: Software piracy. They will end up making more money off subscriptions in the long-term. They are betting you will be using these programs for more than a few months. Some rudimentary math (you can get Adobe CS6 Design Standard for a little over $1,200 on Amazon) willl show you that if you stick with the subscription for a couple of years or so, Adobe will be earning more compared to their old business model. Is This the Future of Software? Is Adobe’s head in the clouds? Perhaps. But they may have just have created a path in which I believe many software companies will follow. Adobe’s move to a subscription-based software model is a really big deal. This move will most likely ripple waves of influence throughout the software community. It’s that significant of an event in my opinion. If the Creative Cloud is successful, then almost certainly, many other software companies will follow. No one will want to be part of the old boxed software model; it will seem so outdated, especially when there’s potentially more money to be had in the subscription model. This is the turning point for boxed software. A point in which we will look back to for decades to come. We might even explain to our grandchildren that “back in our day, we had to use CDs and pay only once to install software” in a weird, shaky old voice. Even if Creative Cloud adoption is slow, you might cave in after Creative Cloud software gets much more advanced in features compared to the older Creative Suite boxed software versions. Adobe has already openly admitted to being nervous about this move. It’s kind of an “all in” bet for them. They can lose big if people don’t take to this subscription model and instead choose to use alternative, competing software. This will either solidify Adobe as a company that’s here to stay forever, or this will be the moment its competitors will exploit a weakness in this industry-leading company. Personally, I would bet that they are going to be successful. More than that, they will help pave the way towards a rethinking of the traditional software distribution model aimed at web professionals. People have grown very comfortable and loyal with their Adobe software products. To leave would be to set themselves back in having to learn a new product, and a new way of producing.